I mentioned at the Urban Hermits’ place recently that I had a new painting in the works. Here is the end result; it was commissioned by a friend as a gift for her husband. I gave it to them on Friday. Merry Christmas, everyone, and may the new year be overflowing with blessings! That is a beautiful painting, Julie! Absolutely breathgiving! Your friend must be thrilled!! It’s truly – beautiful. The Light of the World. I can see why they like it. Light and hope. Very nicely done. Watercolors? 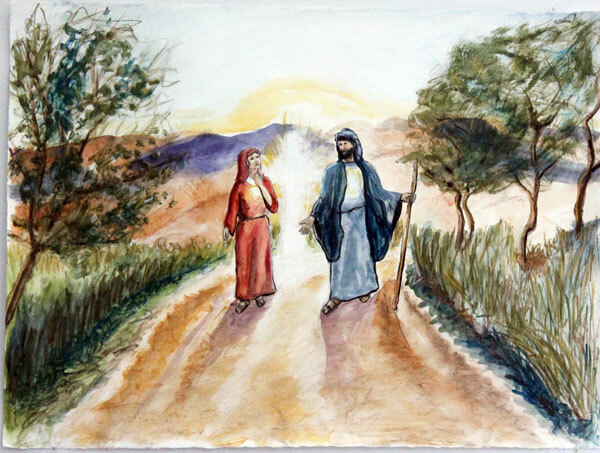 Love the imagery of the cross of light between the two travelers. Nice Julie. Almost looks like you might find the road to Damascus.between them.